Imagine if every individual looked for an opportunity to help one another on a daily basis. Imagine the difference it would make if we all were committed to Pour on the Goodness. But, it doesn’t stop there. My family fell in love with their surprisingly delicious and creamy Flaxmilk. Although it’s amazing on it’s own, it is also perfect to pour over cereal, add to coffee or combine into a breakfast smoothie. And because it’s incredibly versatile, their Flaxmilk can be utilized in a delicious fall recipe, like our easy Gluten-Free Pumpkin Spice Pancakes. You just can’t go wrong! 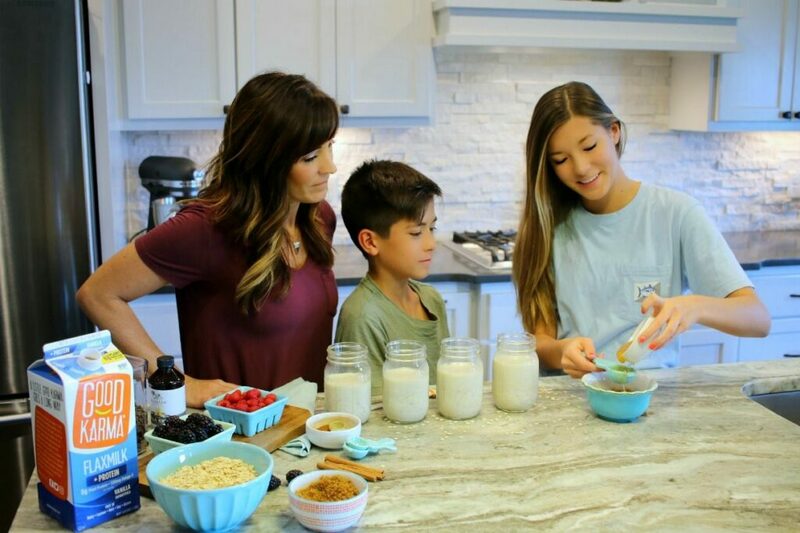 Good Karma Foods encourages you to not only “pour goodness” into your cereal, but to pour it out in an effort that ripples goodness to our families, neighborhoods and communities through their Pour It Forward platform. It’s about finding ways to activate positive change, support causes, and try to make people’s days a little bit brighter. Most of the time, it’s the little, daily things we do that make the biggest difference. From paying someone a compliment, holding the door open for the next person, buying someone a cup of coffee☕️ or putting down your phone to be engaged in conversation. Our family makes doing good a priority and a daily practice. Since our mornings are a little busy, we like to use the evening to reconnect. It could happen while cooking dinner, as we are prepping overnight oats or packing our lunch or sometimes it’s simply while sitting by the fire, drinking hot chocolate. However it happens, it allows us to unwind and organically share our ups and downs. Part of that usually entails how we can make it better, not only for ourselves but for someone else. 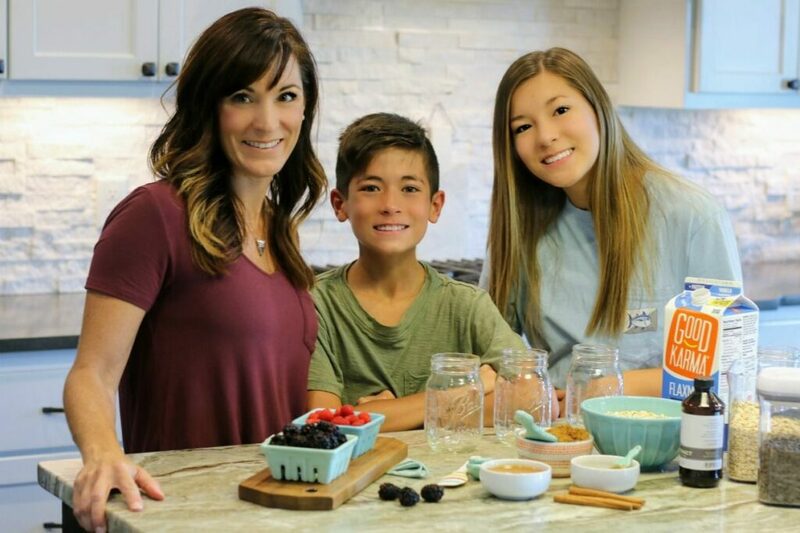 For me, writing this blog is a way to help others, by providing recipes, resources and tips for the food-allergy community. I also like to shop local & with organizations that give back to the community, and make it a priority to set aside time weekly to pour into others while the kids are at school. For the kids, it may be helping someone with homework. Including the new student at lunchtime or recess. Sometimes, it’s just using their manners or being a positive example and providing encouragement to their friends. For the family, it’s opening our home to others, serving at church, giving to organizations, making time for each other and finding ways to serve others as much as possible. Partnering with Good Karma is another small but mighty action we’re taking to make a difference. For example, on behalf of Good Karma, I’m honored to Pour It Forward to you by sharing a $2 for $2 offer. 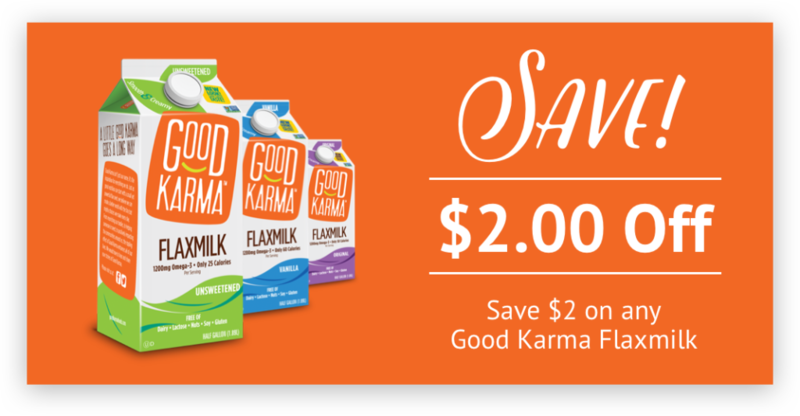 Click the below link to download a $2 Good Karma Flaxmilk offer (a ½ price value). Once you download the coupon, Good Karma will match the coupon with a $2 donation to community organizations that are inspiring and activating goodness everyday, including FARE’s The Teal Pumpkin Project, The GrowHaus and The Gangsta Gardener. Together, we can find ways to influence positive change, support causes and try to make someone else’s day a little brighter. What is one small thing you can do today to pour it forward? Good Karma products are available nationally in natural food stores, mainstream supermarkets and superstores. Visit the Store Locator on the Good Karma Foods’ website to find a location near you. Love this good karma mantra. It goes beyond the bowl! We love Good Karma Flaxmilk. 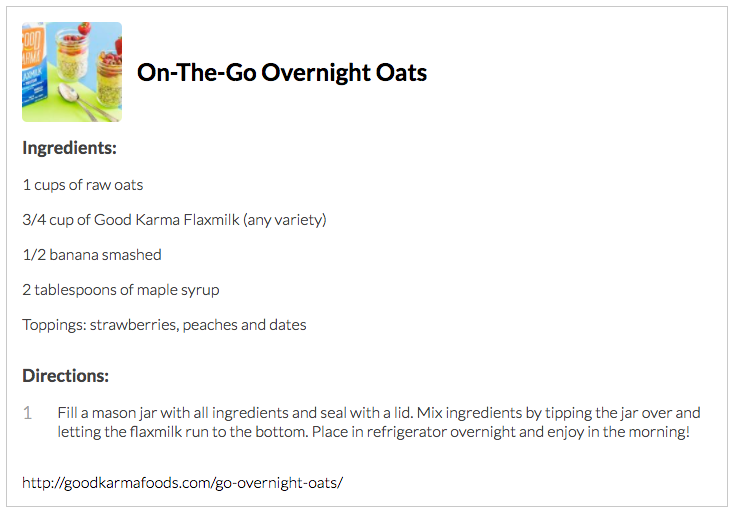 I mix the the flaxmilk with protein into my overnight oats. Super good! Me too! I love that extra protein in my oats as well. 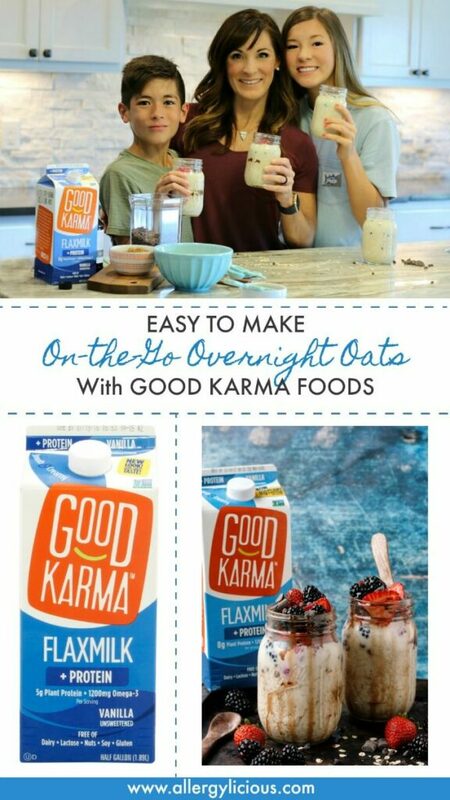 I haven’t yet tried this Good Karma brand! Also, I like how versatile it can be with many different types of recipes! We love Good Karma at our house. And your kids are just too cute! Fun to have a mini family photo! 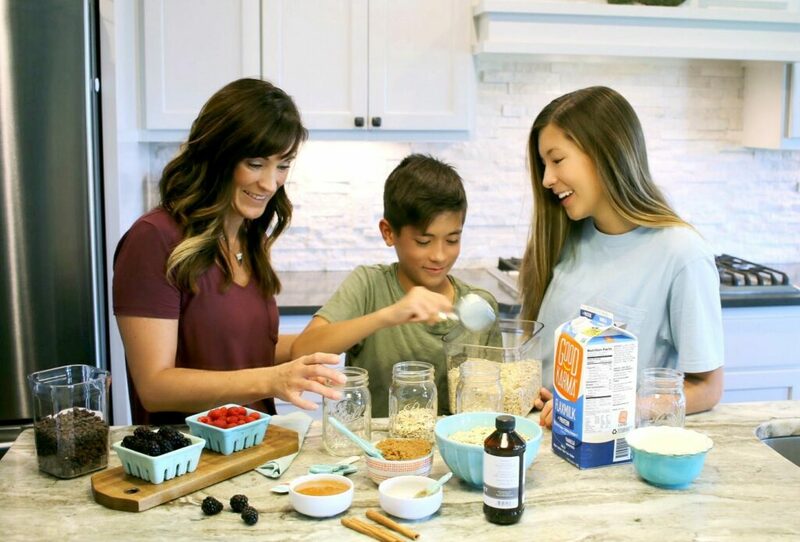 What a great message to be spreading and also so awesome that your kids are so comfortable in the kitchen. I think that kids learning to cook young is so empowering. So true Kortney. 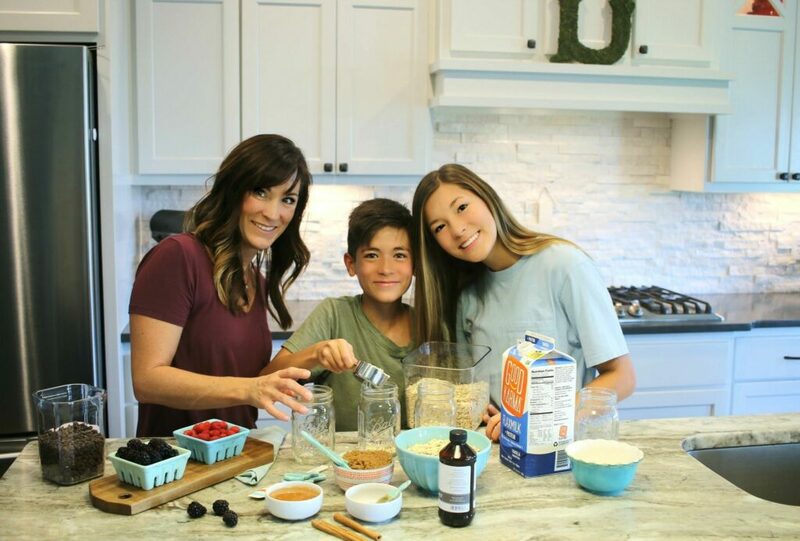 I love seeing the kids in their cooking and creating recipes without me. I can’t wait to try flax milk…it sounds intriguing. I love that this company gives back and loves their community. So good to know there are companies that not only taste good, but also give back and help others. I used the store locator and I don’t see anything nearby . 🙁 I’ll keep checking. Those pancakes are beautiful. I think we should have them for supper! My toddler loves to help with pouring and mixing. I know Miami is a large area but hopefully you’ll be able to find the Flaxmilk at Target or WholeFoods. We don’t have all the options here in Oklahoma yet, but we do have the milk. I bet you’ll get it all before us! I love companies that give back! And that you are finding a way to give back yourself! Will definitely have to check out this brand. 🙂 pouritforward! Now if that adorable family doesn’t sell a load of milk beverage, I don’t know what would!! Too cute and of course, love the deliciously easy recipe. You are too sweet! I just hope that a lot of people download the coupon so they are able to give big! We love this brand + we love that this company makes such a big difference in the community! Adorable photos + I love your recipe!